Gameloft have done it again, this time bringing the classic mind bending, addictive and fun little puzzler called Blokus to the iPhone and iPod touch. Rules of Blokus are as follows: Four players start on 4 sides of a square board and place colored puzzle pieces assigned to them on the board. You pick your color from yellow, blue, green, or red and then each player places a block on the board and the turn rotates through the other 3 players. You can only place blocks that touch your existing blocks on the corners (not the edges) as highlighted on the board. As you and the other three players approach the center of the square you’ll start to run out of real estate, things start to get interesting. Your goal is to put as many of your pieces as you can on the board and block the board so that your opponents can place their blocks down. Players who are not able to fit remaining pieces on the board are forced to stop play. Points are scored by the number of squares players placed on the board. Each block can cotain anywhere from 1 to 5 squares. When placing down your pieces Blokus on the iPhone gives you a circle tool with two grips that you can use to rotate your piece and flip it horizontally or vertically as well to fit. Learning Blokus on the iPhone is quick and you get hints to help you along the way. 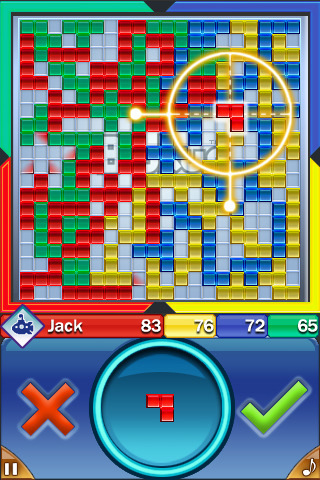 The iPhone Blokus game also has online multiplayer version where you can also try to win different cups. A total of 4 variations on the Blokus game are included. 1) Classic 4 – Four players each control 1 color. 2) Classic 2 – Two players each control 2 colors. 3) Classic Team – Four players play in teams. Playing multiplayer online requires you to setup/login to an Gameloft Live account. Once you log into the system you have to find people to play with. In my case I was not able to find a single soul to play against, which basically means you’ll be playing against the CPU the whole time, unless this game somehow sells a ton of copies. Choose from three difficulty levels (easy, normal, hard) and you can enable or disable a timer to make the game more interesting. In the game you are given small hints about the strategies used in Blokus. For example, Establishing “eyes” (small hemmed-in spaces of one, two, or three cells) is important: other players cannot move into them without wasting valuable small tiles. There should be a way to disable the hint highlighted squares in the game for pro Blokus gamers as well. The music is very addictive and fits the game well. The graphics are pretty sharp. Overall a good iPhone game that could benefit from popularity. Update: The folks at Gameloft have dropped the price on Blokus to $0.99 for a limited time. AppSafari review of Blokus was written by Joe Seifi on July 9th, 2010 and categorized under App Store, Fun, Games, Multiplayer, Puzzler. Page viewed 7238 times, 2 so far today. Need help on using these apps? Please read the Help Page. I tried finding this app because my boyfriend has it and I love Blokus, but it states it’s not available in the US. Will this become available? ?